I have been teaching art to adults and children over a period of several decades. Classes are available in different media: oils, watercolours, pastels and mixed media. No previous experience is necessary. Full refunds for cancelled classes. Due to popular demand, online classes are now in production! Contact me to enquire about current and upcoming classes and seasonal workshops. Subscribe to my monthly newsletter to be updated on classes, new works, and events. Mixed media using watercolors and soft (dry) pastels offers wonderful ways to construct textural, 3D looking artworks, while enjoying the relaxing, meditative, therapeutic aspects of art-making. Explore fun, traditional and experimental ways to apply these materials to achieve interesting effects. We start with a paint-along demonstration, then branch into individual choices of subject. No prior experience or drawing ability necessary. Continuing students will work on their own projects with individual mentoring in developing their portfolios and styles. Render flowers richly and beautifully in oil paints! Discover how to achieve vibrant, confident-looking artworks that convey a sense of light, shadow, and sculptural form. Color mixing and brush stroke application will also be a major focus, to avoid muddiness and over-blending. You will start with a paint-along demonstration, then work on your own choice of subject. Continuing students will work on their own projects with mentoring in developing their portfolios and styles. Render flowers richly and beautifully in oil paints! Discover how to achieve vibrant, confident-looking artworks that convey a sense of light, shadow, and sculptural form. Color mixing and brush stroke application will also be a major focus, to avoid muddiness and over-blending. You will work with a paint-along demonstration and receive individual attention. Water lily study in oil paints. Oil paint is wonderfully versatile and forgiving, long regarded as the most prestigious medium. It retains its freshly-painted colours when dry, remains lustrous, and can be corrected easily as it stays wet for a longer time than other paints. Fiona Craig attempts to make learning oil painting easy and enjoyable. 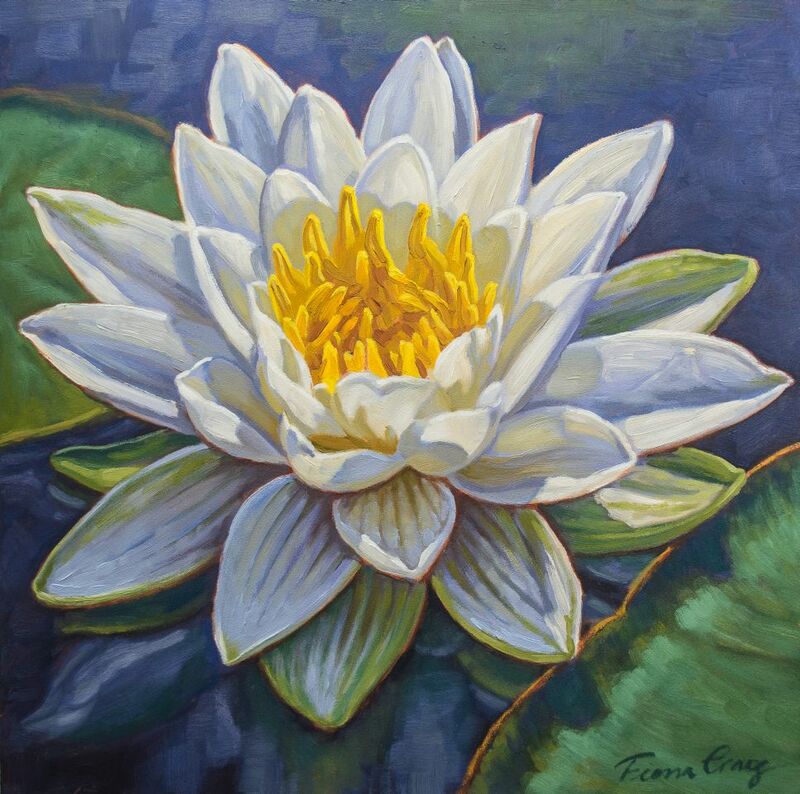 "I attended Fiona Craig's weekly oil painting class over a period of several years. I was a beginner with no previous art training. Fiona gave me a great start and helped me develop my own style. Fiona made the lessons very interesting and enjoyable and she was a very patient teacher. She made me love art so much I am still painting. I would highly recommend Fiona Craig’s art lessons." Filiz Yavuz . "I enjoyed Fiona Craig's [5-day, April 2018] workshop. I learned a lot and her gentle way of teaching was great. There was great camaraderie among most participants and we all gained lots of useful tips, techniques and knowledge of the process of oil painting." Sigrid P.
Watercolour is a favourite medium for many, and although it is often regarded as soft and delicate, it can also produce strong, vibrant paintings. Fiona Craig's watercolour classes provide a variety of interesting techniques in this medium that is so fascinating in its interplay with water. Soft pastels (dry pastels, not oil pastels) are experiencing a resurgence of popularity. This is no surprise, as their soft, velvety texture reflects the light at different angles, creating a uniquely appealing effect. Fiona Craig's classes explore ways of making marks, blocking in, and layering to build up richly colouful and textured works of art. in pastels alone, or in combination with other media such as watercolours. James D. McHolland, age 83, semi-retired.